Blog » News & Events » Bonjour Sage One France! On Monday (3rd June 2013) we welcomed another international Sage One solution – la France, 10 points! (See www.sageone.fr). If you’ve ever driven round the peripherique in Paris you may have seen the two huge Sage signs on top of our offices there. Sage France has over 600,000 start-up, small business and mid-market level customers. We chose to offer these two levels of service to respond to a strong customer demand in France for a very simple quotes and invoices solution, which then fits seamlessly into the simple accounts product as well. This gives customers flexibility at a great price point. 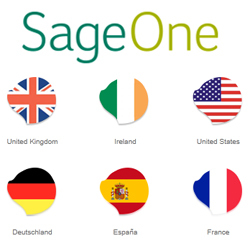 In Europe, Sage One has added three new countries in under three months – going live in Germany on 25th March, Spain on 29th April and now France on 3rd June – bringing the total to 6 alongside the already existing UK, Ireland and USA. We are able to bring the solution to different countries with different compliance and language requirements because Sage One is built with extensibility in mind. Some of the core application is the same in all countries – although of course translated into the local language – while the compliance and local needs can also be delivered quickly. Sage also has local business and compliance experts in each country while the engineers in development and testing work collaboratively across borders to deliver the solution. We hear a lot on the news about the doom and gloom in the European economy. However, start-ups and sole traders are growing in number and we’re very pleased to support them with a simple, inexpensive solution to help them to run their business online, backed by the experience and world-class customer service that Sage offers. Any questions or feedback please let us know by leaving a comment below or on Twitter including the #SageOne hashtag.